Article taken from Ayuntamiento de Durcal website – www.adurcal.com. The Lecrin Valley, known as the Valley of Happiness since a well-intentioned curate of the Valley, in his study of place names, christened it as such. It occupies a tectonic basin between the south-east of the Sierra Nevada up to the Sierra de las Guájaras; and from Suspiro del Moro (a watershed between the basins of the rivers Genil and Guadalfeo) the until mouth the River Grande – today known as Ízbor – into the Guadalfeo. The Valley’s location, configuration, position and topography within the Penibética mountain range mean that it is an essential pass between Granada, the Coast and the Alpujarra, as well as a truly unique space. The Lecrin Valley has ideal characteristics for human settlers. Since prehistoric times it has been inhabited due to its excellent conditions. Archaeological remains found in the area are varied and show a very diverse chronology. The oldest held by the Regional Archaeological Museum are three tusks, two jaw bones and various humerus, femurs of mammoths that lived in the Middle Pleistocene Age, some 300,000 years ago and that ended their days at the bottom of the bogs of the Padul Lagoon. The pollen studies of plants carried out at the Lagoon as essential as they are a referent to know more about the natural surroundings long ago in the Mediterranean area from the glaciations of the Pleistocene Age to today. In the same Lagoon a Levallois point and scraper were found which we can date to the Musteriense culture of the Middle Palaeolithic Age and associate to the Neanderthals. Remains associated with human activity were found in the Caves of Cozvijar, a small area where some dolines and caves existed in the limestone: including scrapers, chisels, Gravette points and sheets that we can date to the last Iberian Solutrean or Solutrean-Gravetiense phase. 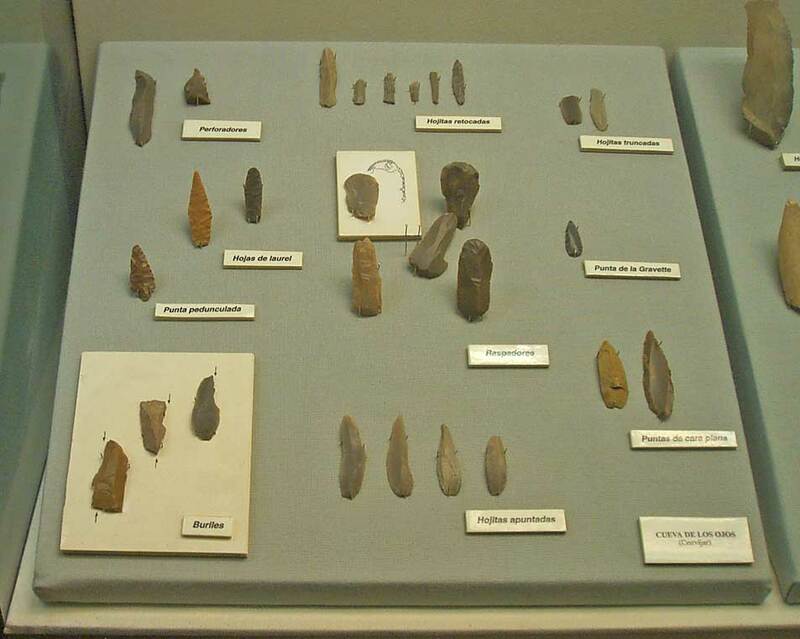 This lithic industry is associated to the Homo Sapiens, which could be represented in a fragment of rib. The remains of cervids, caprids, equids, lagomorphs and ursids were also found at this site. The Neolithic Age is represented in the Lecrin Valley by the remains of a jar and limestone bracelet that were found along the rambla de Santa Elena in Padul and an earthenware cup withdecoration, polished stone axes, knives and other tools that appeared in the municipal area of Dúrcal. Professor Rodríguez Ariza studies the site of los Molinos, also next to the lagoon and he tells us of the materials found belonging to the Copper Age and the early civilisations of the Final Bronze Age with remains of earthenware jars, ovoid jars and polypod bowls. Ceramics from the Bronze Age appear in the Castillejo of Chite. The Tartessos Civilisation was responsible for the first unifying and civilising element in the meridian zone of the Iberian Peninsula. We enter history with the first written sources. The Bible includes that at the time of the King Solomon, the Hebrews traded with Tharsis. Isaías writes on the naves and the port of Tharsis. Through the poet Hesíodo we know of Tartessos and by the geographer and historian Estrabón, that the Turdetanos who lived in Tartessos had “ancient writings in prose, poems and laws in verse”. The information that we have regarding this time is limited. Although we do know that around the first millennium the Phoenicians started to arrive on the coasts of the south-east peninsula and more specifically on the coasts of our province, commercial colonies were established such as that of Sexi (Almuñecar) and Salambina (Salobreña). The Lecrin Valley constituted an important route of communication between the coast and the centres of population of the plain of Granada, especially Ilíberis. Our rivers were routes that gave rise to Phoenician settlements. Francisco Henriquez de Jorquera citing Florián de Ocampo and other older authors writes about “the foundation of Coxvixar (Cozvijar) by the Phoenicians”. This region formed part of the territory occupied by the mythical civilisation of Tartessos. The Phoenician enclaves disappeared at the beginning of the 6th century due to the arrival of the Greeks to the peninsula. These people created known trading settlements in Mainake at the mouth of the river of Vélez Málaga and in Ulisea on the Granadine coast in the middle of the Alpujarra, which served as the base for mining, we remember the mines in the meridian mountains of the Lecrin Valley. After the naval battle of Alalia in 535 BC, the Carthaginians who defeated the Greek force, established themselves in the south of the Peninsula and took control of the kingdom of Tartessos. At the end of 6th century BC the Iberian civilisation flourished and it is highly probable that the Valley was inhabited during this period by Turdulo or Turdetano andBastetano tribes, urban populations that inherited the Tartessic culture. There are few documents referring to this period, highlighting some remains of Iberian ceramics that have been found in the region, los Molinos in Padul and the Castillejo in Chite. The Carthaginian expansion led to levies in these regions to form the auxiliary troops and the Punic Wars caused bloodshed in these lands. We know that Hannibal had within his army a cohort of youngsters from the Granada region, captained by Phorcys and Aurarico, his fellow countrymen. The Roman penetration on the Andalusian coast began at the beginning of the 3rd century BC after the Carthaginian defeat in the Third Punic War. From that time, the Roman general, Publio Cornelio Scipión, began to extend his domain from the Mediterranean coast inland that finally, Hispania formed part of Rome. Through Roman sources we know of the existence of Colca, great nobleman of Illíberis and its surrounding areas, who prepared an army of 3000 infantry and 500 horses from the city and surrounding area. Under the control of Marco Silano consigned by Scipion they confronted Carthage in the battle of Béstula (Úbeda) in 206 BC and locals from this area joined this army. The new Roman administration caused the Colca uprising in areas of the Alpujarra and Lecrin Valley. Marco Elvio was commissioned by Rome to quell the revolt, the historians of Rome abstained from highlighting the success of the company although they confess to the death of Cayo Sempronio Tuditano, this makes us think that the company had to be a disaster for the interests of Rome. Romanisation took place in conjunction with the conquest or the acculturation of the indigenous people by Roman civilisation. This process was carried out in various ways: the foundation of cities, development, development of economic, political and social structures, as well as the establishment of Latin and later the diffusion of Christianity. Likewise, the Romans carried out administrative reforms organising the territory into provinces. The Lecrin Valley formed part of the Citerior and later the Bética provinces, which, once they were divided into legal circumscriptions, pertained to that of Gades (Cádiz). Various archaeological findings have highlighted the presence of Roman settlements in the Lecrin Valley. One of the most significant findings of the region is found in the Feche in Mondújar, where in 1983 part of a Roman villa was excavated. Mondújar may originate from “mons, montis”. In the villa, remains of thermal baths were found, with a cold water room (frigidarium) and another of hot water (caldarium) that has an ingenious heating system (hypocaustum). The patio is conserved with a magnificent mosaic floor, decorated with columns and sculptures, which include a male bust and the torso of a female figure, the Venus of Feche, which constitutes an idealised canon of the body of the woman as well as the remains of stucco and paint on the wall of the baths. In the same municipal area of Lecrín we find some archaeological zones in the Macaber de Talará, ancient Burgil, in the village of Chite, in the area of Chifle and next to the castle of Loxuela in Murchas where there are abundant remains of Roman tiles stuffed in its walls. We find mill stones, mills in Mondújar, Chite and Murchas. Fragments of Roman tiles and various coins were found in Dúrcal, including a bronze sestercio of Tiberius Claudius, minted in 41 BC and others of the epoch of Alejandro Severo (227-235 AD) Trajano (98-117 AD) and Antonino Pío. In this same place, a potter’s workshop and a Roman village from the first century AD were discovered in 2000 in the area of “Las Fuentes” and are appending study. El Padul, its name is of Roman origin from vulgar Latin “padule” and this from “palus, paludis”. Two Roman tombs were excavated on the farm of la Cuesta in the area of los Molinos, Padul. The archaeological site of “Las Viñas” in Padul uncovered pieces of Roman tiles and fragments of Hispanic and African sigillatas. The Archaeological Museum of Granada houses a chandelier decorated with a dolphin from the area of las Tabernillas. In the ravine of el Alcázar in the municipal area of Villamena we also find types of sigillatas and Roman tiles, however, without doubt, the most monumental is the aqueduct that transports water from the River Grande of Cónchar to the lush land of Melegís. 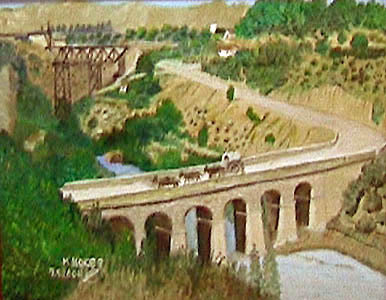 The thirteen-arch aqueduct gives its name to the irrigation channel of los Arcos that increased the surface of irrigation of the ancient irrigation channel of el Burgo, whose name comes from the Latin “burgus”. Pinos comes from the Latin voice “pinus” and Tablate from “tabula” referring to the bridge that was used to cross the ravine. At the farmhouse of el Marchal, Saleres, we find a significant number of pistrins. Remains of Roman tiles and sigillatas were found in the ruined upper quarter of Saleres. We can conclude that the Romanisation was significant in the Lecrin Valley, that a considerable number of villas had settled along the Coastal and Alpujarra routes. In these villas the irrigated farming, olives, cereals and vines were quite developed and together there was a transformation of the products in the oil, flour and water mills. No population has left such an indelible imprint on our region as the Muslims. The Andalusí legacy in the Lecrin Valley is notable in many aspects; farming, development, thought, art, literature, in our way of life. The Muslim presence in our land lasted eight hundred years, during which the Lecrin valley adopted its own physiognomy, an administrative identity, configuring part of our historic roots. The territory occupied by the Muslims, called Al-Ándalus, became a province of the Islamic empire, later experiencing a complicated political evolution. First political independence was obtained with Abderramán I who disembarked in the year 755 in Almuñécar where his supporters were waiting for him, indigenous to these regions. This provoked the declaration of war by Yusuf and Somail, with the Lecin Valley being the backdrop of the uprising that led to the formation of the Emirate. Abderramán III conferred religious authority to himself proclaiming the Independent Caliphate; this was a period of economic and cultural splendour interrupted by the division of the kingdoms of Taifas and the Almorávides and Almohades invasions, culminating in the formation of the Nazrid kingdom of Granada. In the period prior to the formation of the Nazrid kingdom, the Lecrin Valley was known as Iqlïm Laysar by-Udrï in the 11th century and as Iqlïm al-Usar or Iqlïm al-Asar by Ibn al-Jatïb in 12th and 13th centuries. Through Ibn al-Jatïb we know of the campaign of the year 1125 of Alfonso I “the Warrior”, after the battle of Armisul he marched towards the Coast. Alfonso returned to Aragon with almost ten thousand Mozarabs (Christians under Islamic rule) from Granada’s regions, settling them in Mallen on the banks of the river Ebro and others were deported to the African coasts. 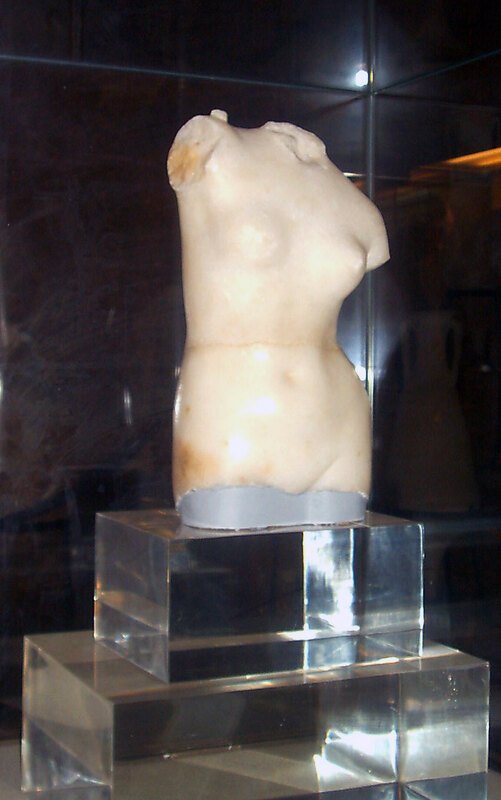 Others continued populating our Valley as stated on the Mozarab plaque discovered in Padul in 1880 and it is contained in the Regional Archaeological Museum. Iben al-Zubayr named our region Iqlïm Garnäta which means district or climate of Granada because of the biographies of two characters one from Dúrcal and another from Nigüelas. The Lecrin Valley belonged to the Cora de Elvira and Yäqüt called it Iqlïm al-Qassab, which means sugar cane district, as it served as the access to large plantations of this grass, originally from India, which was sown on the Coast. Most of the villages in the Valley that we know today constituted clusters of farmhouses that had warning and defence towers, flour and oil mills, fulling mills, a mosque with its Koran school, rabitas and mausoleums for burials. Some farmstead towers have remained such as that of Izbor that gave its name to the village, the Tower of tío Bayo at the farmstead of Naio or Naxo in Albuñuelas, that of Nigüelas and that of Márgena. The farmsteads comprised quarters or quarters within irrigated farming land and defended by forts or castles. Examples of this are the different defensive fortifications generally built with cob wall techniques and reinforced corners, which are found in several places as the fortresses or castles of Albuñuelas, Nigüelas, Murchas, Chite, Tablate, Padul, Venta de la Cebada, Restábal, the fort of Mahína or Márgena and the Rock of los Moros in Dúrcal or the watchtowers of Cónchar, Saleres, Acequias. In the latter period of Muslim dominance, this region became a protagonist due to its significant geo-strategic position. The Nazrid kingdom of Granada suffered numerous ills at the end of 15th century; on one side the unstoppable Christian reconquests and on the other, the internal crises and the dynastic struggles. The confrontations between the Granadine king, Muley Hacen and his son, Boabdil contributed to weakening of the kingdom. 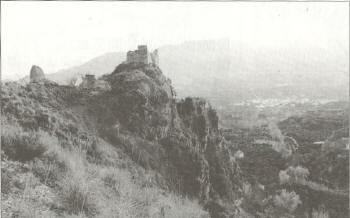 In 1483, Boabdil and his supporters refused Muley Hacen entrance into Granada and he had to return to his fortress in Mondújar with his favourite Zoraya, the daughter of the knight commander of Martos, Isabel de Solís. From Mondújar where Aben Jamy, Aben Celim, Cid Hiaya, Reduan Venegas and el Zagal came, attacked the city of Granada until conquering it. Two years later, however, Muley Hacen abdicated to his brother. Separated from the government, he died in the castle of Mondújar. From that time, his brother al-Zagal took power, which did not last very long, as in light of the Christian siege and skirmishes with his nephew Boabdil, he decided to yield and hand over to the Catholic Monarchs his lands that spread from Almeria to Padul. From the agreements of December 10, 1489 el Zagal undertook with the Catholic Monarchs to hand over his land in exchange for the title of king of the Lecrin Valley as perpetual majesty. For his part, Boabdil continued his struggle against the Christians and in 1490, after the uprising of the Alpujarra and the Lecrin Valley, he managed to recover the fortresses of this region except that of Mondújar which was defended by Guiomar de Acuña, wife of Pedro de Zafra, brother of Hernando, secretary of the Monarchs. The Christian reaction was swift and in 1491 the marquis of Villena, Diego López Pacheco sacked and burnt nine places in the lower Valley and that same year the kingFerdinand the Catholic once he had laid siege to the city, sent the army to Padul, forcing the Muslims to be confined to the surroundings of Beznar and Tablate. From here Zahir Ben Atar made the king withdraw, killing the young Juan de Avellaneda, page of the Queen Isabel. El Padul was taken definitively in 1491, which is represented in the chorister of the cathedral of Toledo. The handing over of Granada to the Catholic Monarchs by Boabdil took place in stages, this pact allowed the Muslims to remain in this territory and maintain their customs. During the month of January of 1492, the Lecrin Valley witnessed the sight of the sad cortege formed by Boabdil, Moraima his wife, Aixa his mother and Aben Comixa his secretary; exile route in the tahá of Andarax. The king Boabdil, his wife Moraima, his sons and his mother had to leave for the estate they had been ceded in the Alpujarras, where they remained for a short time and then were finally expelled. Days before being exiled, Queen Moraima died and her body was laid to rest next to the remains of the previous Nazrid monarchs, in the royal rauda (mausoleum) that Boabdil transferred from the Alhambra to Mondújar. Cohabitation was not easy and the Moriscans of Granada led numerous uprisings, in which the Lecrín Valley became the centre of its operations. In 16th century when most of the churches in the Lecrin Valley were being built, Beznar church possibly being the first, as demonstrated in its architectonic style with Gothic pillars that support pointed arches. In this church work was carried out in the first quarter of the 16th century. Later, the tightening of the measures adopted towards the Moriscans, who were prohibited from speaking their language, customs, festivals and dress etc.. caused a new insurrection in Christmas of 1568 in the entire kingdom of Granada. The intransigent policy of Phillip II against the Moriscans led to growing discontent among the Moriscan population and groups of monfíes (group who had fled to the mountains). 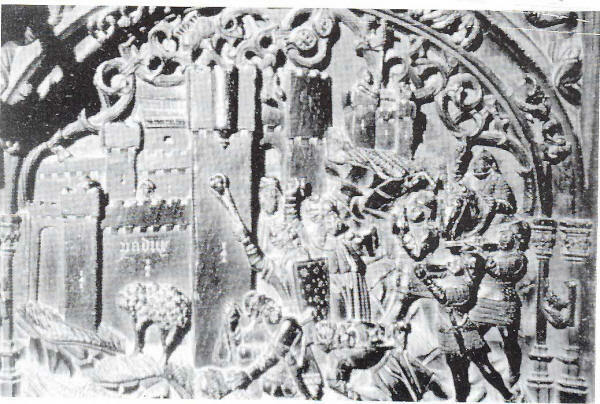 This gave rise to skirmishes between monfíes and old Christians, one example being in Béznar, where a group of the monfies of the Nacoz de Nigüelas removed the Holy Sacrament, injured and killed and captured the María Trinidad and were attacked by the Mosqueteros armed by the marquis of Mondéjar Iñigo López de Mendoza. The uprising of the Moriscans against King Phillip was very significant in the Lecrin Valley, as the Moriscans appointed Fernando de Córdoba y Válor under as king in Béznar under the name of Abén Humeya. On the night of December 24, Fernando met with his relatives los Valori, insisted on him being king, on 25 or 26 he was chosen as such with the name of Muley Mohamete Abén Humeya and on 27 he held talks of his appointment by Farax Abén Farax, reaching the agreement to name him his bailiff mayor. Farax ignited the rebellion on believing that the city and the Alhambra were his and there were uprisings in the Albayzin. The insurrection extended throughout the old Nazrid kingdom. The marquis of Mondéjar, Iñigo López de Mendoza in the first days of 1569 left Granada with the aim to stop the uprisings. We know from his campaign logs what happened on the night of January 10 in Chite, with it being necessary to spend all night with arms at hand. On the following day he took the route of Tablate, where the Moriscans had ruinedthe bridge, the marquis in the vanguard of his army, approached and it was the valiant initiative of Brother Cristóbal de Molina who reached the other side of the bridge with many losses for the Moriscans and few for the troops of Mondéjar, although the marquis was shot by a Moriscan rifleman, which did not stop him from advancing on Lanjaron in pursuit of the rebels. Antonio de Luna was responsible for overseeing the Lecrin Valley and the Plains of Granada to guard against prevent adhesions to the rebelling Moriscans and therefore, on the first of June 1569 he took punitive measures against Albuñuelas and in late July against Pinos, Restábal, Saleres and Albuñuelas. In the latter he had to withdraw in light of the increased number of Moriscans that had gathered. This encouraged the uprising Moriscans who attacked the second lieutenant Moriz in the Talará gorge, where he perished along with 250 soldiers, who were marching to help Orgiva, at the hands of riflemen and crossbowmen commanded by el Nacox of Nigüelas. From Nigüelas it was also Pedro de Vilches, nick-named “Pie de Palo” who abandoned the pass of the Talará gorge, changing it for that of “los Nogales” and thus facilitating the passage of the Tablate gorge and help onto Órgiva. A little later he ordered the removal of the garrison of Tablate and move it to Acequias, more convenient place for the safety of passage. In August 1569, the Moriscans of the Valley decided to attack Padul, a place where there had been no uprising and that was the general barracks of the troops of Phillip II. They sacked the town and tried unsuccessfully to take the house from the Martín Pérez de Aróstegui. Gonzalo Fernández de Córdoba Duke of Sesa inherited from his grandfather, the Gran Capitán, the majesty of Orgiva and he was sent to defend it with an army of six-thousand strong infantry and three hundred horses that camped in Acequias when the duke suffered an attack of gout. Finally, in 1570 the monarch Phillip II entrusted Juan de Austria (at the front of the army) and diverse Granadine authorities to the definitive expulsion of the Moriscans from Granada. Therefore, he ordered that on the first day of November 1570 all Moriscans and their families be gathered at the churches. The Moriscans of the Lecrin Valley were transferred to the Royal Hospital of Granada and then dispersed throughout Extremadura, Tierra de Plasencia and the Kingdom of Toledo. The expulsion of the Moriscans brought with it fatal economic, social and demographic consequences. The absence of population was especially felt in this region, that previously in 1568, had approximately 1362 residents (in total 5448 Moriscan inhabitants) with the most populated places being Dúrcal (with 800 inhabitants), followed by Padul (724 inhabitants), Nigüelas (560 inhabitants) and Lanjarón (with 400 inhabitants). The governors aware of the severity of the problem, took a series of measures to alleviate the situation. Firstly, the protection of the fruit trees was ordered, the houses, public buildings and churches rebuilt and fundamentally began to bring people to fill the population void. These populators constituted the Brotherhoods of the Holy Sacrament in each of the parishes to which they belonged. The repopulation was carried out with “old Christians” from outside the kingdom of Granada, with whole families moved to the region in exchange for significant plots of land and a house. Few accepted this offer, therefore the 744 residents (some 3,000 inhabitants) that repopulated the Lecrin Valley were mainly from Andalusia (Jaén and Córdoba) although repopulators arrived from other places such as Extremadura, Castilla (Cuenca and Toledo) Galicia, León…etc. Over this period, significant changes took place in the area which affected the social, political, economic and religious order. These two centuries have not been studied closely, although we do have the parochial records of christenings, deaths, wakes and marriages, register of neighbours, inventories and incorporations which, along with the Notary Protocols of the province of Granada, can shed some light on this 200 year time span. It is risky to generalise and all the more so if we rely on unsystematic information from censuses and registers. In the year 1609, king Felipe III granted the title of Colossus of the Order of St James of Compostela to Antonio Aróstegui, His Majesty’s secretary of State, for his and his father’s services to the burgh of Padul during the Moorish uprising. Antonio Aróstegui ordered a house to be built in Padul in memory and recognition of his father. 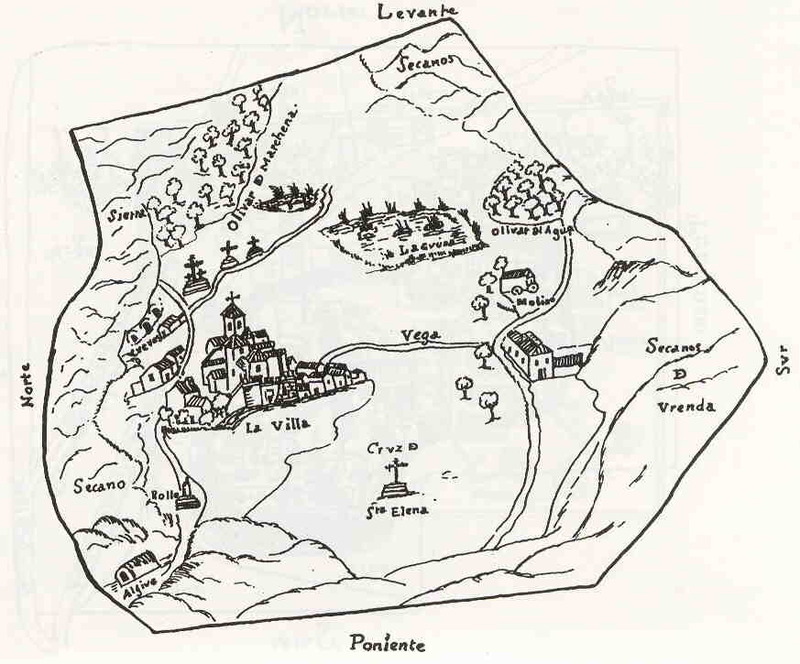 In mid-September 1616, Lecrin Valley was plundered by militia companies from the city of Granada. The militia were going down to the coast to defend it from an attack by forty Turkish ships. When they reached Béznar and Restábal, they were informed that the ships had withdrawn and they were therefore to return to Granada, but the militia took advantage of the absence of Valley locals – who had gone down to the coast armed with muskets and blunderbusses and succeeded in repelling the Turkish ships – to rob all they found in our villages, slaughtering hens and livestock and taking all the grapes from the vines. In 1626, the jurisdiction and lordship of the burgh of Padul was offered for sale by His Majesty and was purchased by the city of Granada, council and aldermen, the first governor appointed being Juan Luis Castellón, the head scribe of the city council. There was an interesting change in the social, legal and economic order in the burgh of Cozvijar at the beginning of 1639 following its purchase by lawyer Gregorio López Madero, member of His Majesty’s Council and hearer in the Royal Council of Castile. As regards population growth, in spite of there being no study of all the villages in 17th century Lecrin Valley, we can state that there was a slight increase in the number of inhabitants if we generalise the information from the demographic study of Acequias, Talará, Mondújar, Murchas and Melegís. There was an overall increase in this century, in spite of the waves of epidemics, scarcities and famine that affected the whole of Spain, but were less severe in the Valley. The 17th century witnessed the burgeoning of religion and culture that took place as a result of the Baroque, Catholic propaganda and the patronage of civil and ecclesiastic institutions. In 1632 and the following year, our villages were ravaged by an epidemic that decimated the population, possibly the Milanese plague, which broke out in Catalonia in 1629and 1631. Less virulent was the 1649 epidemic which we did not escape, in spite of the strict cordon placed around Sierra Morena to attempt to contain it. The fifteen years from 1665 to 1680 saw a steep demographic decline, for even though the epidemics were less virulent they were more tenacious. Particular mention must be made of the outbreak of bubonic plague in 1678 and 1679. Nevertheless, we find a positive result in terms of growth of vegetation by the end of the century which is quite exceptional if we take into account a context of catastrophic mortality, poor harvests and food scarcity, and pest epidemics that destroyed the human surpluses built up over the good years. In the face of each of these crises, the population of Lecrin Valley responded by marrying more and having more children, which was how the final balance ended up being positive, also helped by the gentle climate and fertile soil. The exception to this rule was Padul, which “suffered so extremely the plague of 1679 that out of 110 families 204 persons perished, so that the hospital which was built, and the houses, were left empty and abandoned, with not a piece of clothing or precious thing remaining as they all were burned to halt the spread of the disease, and the few residents left in the burgh were so afflicted, having no beds to sleep in nor clothes for their backs, that they had to beg for alms in other villages, and for the amount they had spent on treatment they had no strength left to sell their crops and left them unharvested. They were greeted with rifle fire in other villages. One could not travel the roads without a document attesting to provenance from places unaffected by the plague. Travellers stopping in inns or taverns were made to wash their clothes in vinegar, and the residents of one village would be vigilant of the residents of another to avoid contagion”. The 18th century saw a gradual revival in general terms which was experienced both in the province of Granada as a whole and in our area. This century saw the establishment of the Bourbon dynasty under Felipe V, supported by Lecrin Valley. There is an interesting painting relating to this above the arch at the entrance to the church in Melegís. Also interesting is the singular personality of Albuñuelas native the illustrious Francisco Perea y Porras, professor at the University of Salamanca and defender of the city with rifle at the ready, capable of defeating the siege makers in the Spanish War of Succession with words of reason. The Cadastre of the Marquis de la Ensenada is a unique document which affords us the most authentic image of our villages in 1752. Through this document, we know that the resident-inhabitant coefficient was around 3.9. 16.1% of families comprised two members, 19% comprised three members, 17.4% comprised four members and 16.3% comprised five members. It is of interest that the agricultural sector was dominant, bearing in mind the significance of esparto grass work(36), although in Cónchar the secondary or industrial sector was stronger. The community of residents defended their age-old right to collect esparto grass in the communal areas of other Lecrin Valley villages and hamlets. The tertiary sectors in Pinos and Saleres were important, since in these villages mule driving for the transportation of goods was a major activity. We can talk of the existence in Lecrin Valley of a sector of primary school teachers unequally distributed across the villages, and the same is true of the medical practitioners such as doctors or surgeons who had to compete with the blood letters, and then there were the chemists. The stagnant economy was reactivated by an increase in cultivated area and intensive cultivation practices and the progressive recovery of industrial activity, mainly in the silk industry. In turn, and as a result of the favourable economic climate, there was a notable increase in the population. This growth was reflected across the entire Lecrin Valley, which increased its population to over 10,000 inhabitants in 1730 and reached 13,000 in 1787. From the political perspective, although the country was shaken by domestic uprisings and conflict, we can say that the reigns of Fernando VI and Carlos III were times of tranquillity for the area and also for Granada capital, which favoured major artistic and cultural development. In 1788 work was finished on Talará church, a project carried out by the renowned royal neoclassical architect Ventura Rodríguez, much admired by Jovellanos. The cultural and educational work carried out by the Convent, School and Seminary of Our Lady of Sorrows in Albuñuelas was extremely important. Here the friars of the Franciscan Descalzos (‘Barefoot’) Order taught the two subjects of Grammar and Moral Theology. As a direct result of attending this convent and school, founded by Francisco Perea y Porras, a large number of students from Lecrin Valley could enrol in the University of Granada. Among them was Saleres local Balthasar Vallejo who studied medicine and, based in Albuñuelas, became the doctor for the Lecrin Valley administrative area; nor should we overlook his son José Mariano Vallejo y Ortega, but he is a man of the following century. By contrast with the century preceding it, the 19th century was a period of major riots, uprisings, civil wars, socioeconomic conflict, earthquakes and epidemics. The political situation was complicated: after the Aranjuez Riot and invasion by the French, the War of Independence broke out and a fair number of anonymous heroes from our area took part in this war following their conscription. In Bailén, General Castaños won an extremely significant victory over Dupont and many of our unknown forebears fought in this battle. As is almost always the case, great names pass by unrecorded in history. In our case we can mention Nicolás Bonel y Orbe, first Marquis of Márgena, who was a friend of General Castaños. Of the Herrasti y Pulgar family, Counts of Padul, lieutenant general Andrés Pérez defended Ciudad Rodrigo from the French army in 1811. Then there was José Mariano Vallejo, professor of mathematics, fortification, attack and defence in the Madrid Nobles Seminary from the beginning of the century. On 13 November 1808, Vallejo suggested a military manoeuvre to the Central Junta, and lodged a complaint about the lack of officer training. With the Central Junta he was sent to Cadiz, under siege by the Napoleonic army, to the artillery laboratory where he carried out a study on the siege of the city and on the parabolas described by the French grenades. His brother and assistant Captain Andrés Vallejo, a teacher at the military college in Valencia, designed a course teaching the basics of fortification. 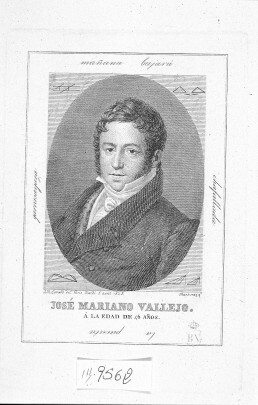 The war ended with the creation of the Cadiz Cortes in which José Mariano Vallejo was elected to serve and swore allegiance to the 1812 Constitution. The Constitution was read out and allegiance sworn in the different churches of our area and in Albuñuelas was celebrated with the ringing of the church bells, loosing of rockets and a musical band. Juan Fernández Cañas, “Uncle Charity“, mayor of Otívar, was a guerrilla fighter who kept the French army on its toes. He skirmished with the Napoleonic troops in the area surrounding Padul. The Count of Montijo was involved and employed a tactic which defeated the French with no loss of his own troops. Lecrin Valley, surrounded by mountains, was the strategic base camp for the Count’s regiment to defeat the enemy, and once again the Tablate Ravine was a vital position which was reinforced with three batteries of cannon. Recruitment was carried out in the villages of the coast and the Valley and a battalion raised by Captain Agustín Irazogui. This caused terror in Granada and French General Soult had to be called in from 30th July to 9th August 1811. In Pinos del Valle, the bravery of the fighters led to the crushing defeat of the French troops under Godinot, which could have been their total annihilation if the local fighters had had proper command. Following the despotic reign of Fernando VII, the problem of succession ensued and the Carlist Wars broke out between supporters of the young Isabel II and those of her uncle Carlos. The latter was supported by Manuel María Montalvo, a rich Chite landowner who, from this location in 1836, prepared a conspiracy with a Carlist faction who marched on Dúrcal, Pinos and Lanjarón; proclaiming Carlos as king, capturing Nationalist rifles, contributions and incomes from the granaries and plundering the houses of the liberals. The conspiracy was discovered and Montalvo was arrested and taken to Pinos del Valle. During the reign of Isabel II the progressives led by General Espartero and the moderates led by General Narváez fought each other for power. In the brief periods when the progressives were in power, ministers such as Mendizábal and Madoz implemented a confiscation process based on nationalisation and the sale of assets belonging to religious orders, the Church and town councils. The confiscated estates were auctioned publicly and the profits used to cover the national deficit and to finance public works. These expropriations had significant repercussions in Lecrin Valley and not solely on land ownership structure, but also on the social and economic order of the area. Although this confiscation process did not bring altogether positive results and there were various problems in our area, it was during this period that there was balanced population growth in Lecrin Valley and its inhabitants came to number over 20,000. The First Republic was formed in 1873 following the abdication of Amadeus Savoy, and with it came the cantonalism promoted by provincial federalist groups. In our Valley theindependent canton of Padul was established, but lasted only a few days. At 9.08 in the evening of Christmas Day 1884, there was an earthquake which lasted 20 seconds and was felt in the provinces of Granada and Málaga. There were 800 deaths and around 1500 wounded, some 4400 houses destroyed and a further 13,000 damaged. In Albuñuelas the death toll reached 102 and around 500 persons were injured, a good number of them in the sadly famous chapel of rest. 90% of the houses in Murchas were destroyed, 9 of its residents died and 13 were injured. The storm of 8th September 1887 also devastated our area. The national press reported that Albuñuelas was the village hit hardest, its irrigation system swept away, three flour mills destroyed and two more flooded with mud, and crops entirely wiped out. There was another storm in September 1892 which although not as severe, did cause enormous damage in Chite and Talará. As if to bear out the saying “it never rains but it pours”, on 17th January 1896 there was a serious fire in Murchas that destroyed 7 houses completely, including their furniture and grain stores. The outbreak of phylloxera that ravaged Lecrin Valley vineyards and the outbreak of cholera in 1885 which caused 257 deaths in Padul brought to a close a fin-de-siècle horribilis. It also saw the loss of Cuba and of Rogelio Vigil, Talará physician, hero of the battle of Baler and one of the last to quit the Philippines. He was shot dead in 1888 in a duel with General José Luis Riquelme. Events over the 20th century were decisive for the development and growth of our area. It was not without its problems. The century which began with Alfonso XIII taking the throne and then Primo de Rivera establishing a dictatorship descended into a bloody Civil War. This conflict caused a deep crisis across the whole of Spain and a long period of famine and want in the post-war period. It was not until the final years of the Franco dictatorship that the economy began to take off and modernisation took place across all sectors. The first decades of the 20th century were prosperous ones for Lecrin Valley. Its population now numbered 21,895 and there was a gradual abandonment of the subsistence agriculture economy in favour of farming more geared to market demand. Improved communication routes and the arrival of the tram, telegraphy and telephone at the beginning of the century, along with the establishment of manufacturing industries, brought significant progress to our region. Special mention must be made of the Dúrcal cable railway which opened in the 1920s, extending 38 kms (the longest in Europe at that time) to connect Dúrcal with Motril port in order to transport goods from the coast inland to Granada capital. Apart from this, in addition to its major agricultural development, by the 1930s Lecrin Valley had become established as a well populated area, its inhabitants numbering 26,918 and the towns of Padul, Lanjarón and Dúrcal having the highest population concentration. However, the progress and growth experienced in the area at the beginning of the century and given a further boost by the Second Republic, was halted by the strife of the Civil War. The beginning of Franco’s dictatorship in the post-war period meant a significant step backwards for Lecrin Valley in economic, demographic and cultural terms; to such an extent that it was not until 1970 that the Valley’s population numbered what it had before the Civil War in 1936 (some 27,356 inhabitants). On 10th July 1964, the repeater station opened in Sierra Lújar and with it a window onto the world, for it brought the television signal – first to wealthy households, bars and taverns, but within a short space of time to all homes, thus ousting the radio set from the dominant position it had occupied until then. Construction of the Béznar Reservoir began in 1977 and was finished in 1985, when it became the coast’s water supply. The Lecrin irrigation channel brought improvements to farming land in this municipality. The arrival of democracy, the approval of the 1978 Constitution and the creation of the autonomous Community of Andalusia brought many significant social and economic changes to our region. The democratisation of our municipal councils and their commitment to improving living conditions in our towns and villages have been notable. Among the innovations of recent years we must highlight the arrival of the service sector, the development of communication networks (dual carriageways, mobile telephony, Internet), improved education, the expansion of rural tourism, the return of emigrants, the creation of the association of Lecrin Valley municipalities, etc. At the dawn of the 21st century the future is there to be made, and it depends on the efforts of all of us who have our roots here and love the Lecrin Valley. Excellent and enjoyable article. Many Thanks.